For many, additive manufacturing (AM) is envisioned as a process that can simply print a print. From CAD to STL to the machine and, voila, here’s your part, right and proper and good to go for you and your customer alike. There’s an expectation that the odd-looking part, created on a computer, can simply be replicated in an AM machine. Perhaps it’s unfortunate that the term 3D printing has taken hold. It implies a process similar to that of a paper copy machine. But, as those in our industry find on a daily basis, nothing is further from the truth. From automotive to recreation to aerospace, AM challenges abound. Fig. 1—A quick simulation of an aluminum aircraft bracket identifies areas of distortion. How then can we protect ourselves from frustrating trial and error and wasted machine time, not to mention wasted labor and material? This is where simulation shines. 1) Distortion. During the build, parts tend to bend out of tolerance. 2) Residual stresses. Stresses during build can lead to part failure, cracking and other unfortunate events, or support failure. 3) Quality. When 3D printing, material is created as the part is created. For an ideal, high-quality part, the material must meet porosity, microstructure and other requirements. Fig. 2—Simulating a thin-walled titanium part for a bike frame reveals distortions, a relatively common occurrence in AM-produced thin-walled parts. Proper simulation, performed at the ideal point in the design-build timeline, can optimize the metal-AM process, providing accurate results while reducing costs and time to market. In the webinar, “Additive Manufacturing Process Simulation for First Time Right,” Bujik touts the advantages of simulation as part of a test-based approach to 3D metal printing. “When something goes wrong as the part is built, the team must go back, perhaps redoing the initial design and performing all pre-processing again,” he says. To minimize that costly and time-consuming situation, Bujik stresses that simulation occur “left of print.” That means prior to the printing process. Simulation for AM can occur at three levels, according to Bujik: micro, meso and macro. Micro simulation is highly detailed and delves deeply into microstructure. Due to cost and time, this process is best performed on small parts or small part sections. “For full build or for larger parts, meso- or microscale simulation is a better approach,” he says. These simulation approaches are simplified and provide enough detail to address process and build concerns and greatly improve the chances of a first-time-right build. To validate the Simufact macroscale simulation process for AM, MSC worked closely with the Fraunhofer Institute in Germany. The team used simulation to validate builds on a variety of metal structures. One case examined an aluminum aircraft bracket (Fig. 1). A couple of years ago, when the testing took place, simulation ran about 20 min. Today, Bujik reports that it can be done in 5 to 10 min. “The simulation captured distortion very accurately,” he says, enabling the team to optimize design prior to build and ultimately delivering an acceptable part. Another case: a thin-walled titanium part for a bike frame (Fig. 2). Simulation results captured distortion of tube diameters and failure of support structure. In both cases, the simulation was validated. Importantly, simulation can extend beyond the actual build itself. For example, the process can address detachment from baseplate, influences of heattreatments to remove residual stresses and mechanical Influence of hot isostatic pressing. 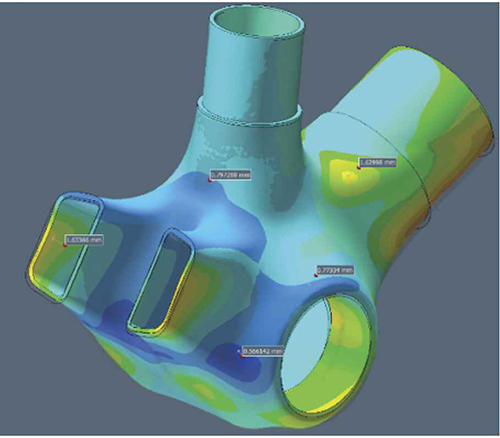 Given the expense of material and machine time, robust simulation can reduce process complexity and pay off in the bottom line. Consider that various factors influence the AM process, including a variety of production methods and their special physics, a variety of 3D-printing machines and their machine-specific influence on the production process, and differing metal-powder quality. On top of that, AM involves a large number of machine input parameters (as many as 200), all having an impact on the behavior of the final parts.